The Kichler Organique large 6 light chandelier in olde bronze finish features natural rustic style that looks just at home in a country cottage or contemporary chic loft apartment. 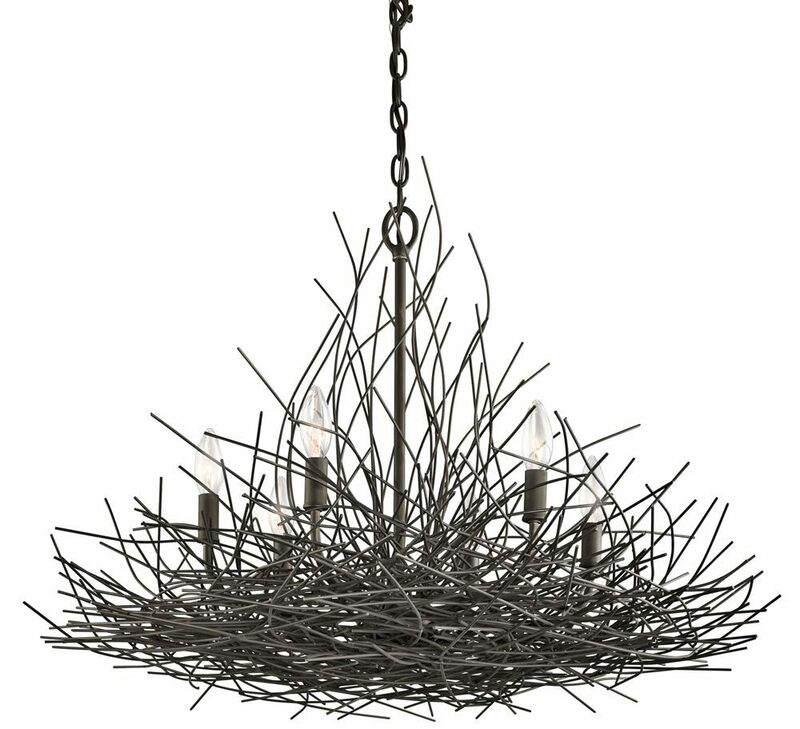 Constructed from bronzed steel wires that resemble a nest, with candle lights positioned on top, this stunning design creates a feeling of nature brought inside your home. Superb quality larger sized chandelier, with ceiling mount, chain suspension and circular frame made from meticulously placed wires, with six candle style lights and matching olde bronze candle tubes. The dressed up rustic styling of the Organique collection is sure to add style and enhance the décor of your large living room, dining room, hallway or bedroom. The natural style and soft bronze finish combine to create warmth and a feeling of homeliness wherever it’s displayed. Supplied with 183cm of chain suspension that can be shortened at the time of installation to achieve the perfect drop. Please see the technical information below for minimum and maximum heights. There are coordinated fittings in the Organique range that includes three and five-light chandeliers; please see below. Designed in the USA by Kichler, founded in Cleveland Ohio in 1938. L.D. Kichler & Co. is a family run business held in high regard for their diversity of design and breadth of range, which includes some truly striking contemporary and substantial light fittings like the Organique large 6 light chandelier in olde bronze finish featured here.